Family-friendly safari tent glamping on a working West Sussex farm on the edge of the South Downs, crafted and created by the well established glamping group Feather Down Farms. It could be said that Manor Farm owns a place in camping history. It was the farm that introduced the world to the Feather Down experience, which has now grown into a 30-farm strong mini empire. The farm's trademark safari-style tents have brought a new level of opulence to UK camping, and its luxurious dwellings are as likely to be seen in the pages of a fashion magazine as they are to be found in Phil from Finance's family album. Manor is a traditional mixed farm of crops, pasture and woodland, situated between Alton and Selborne on the edge of the South Downs, England's newest National Park. 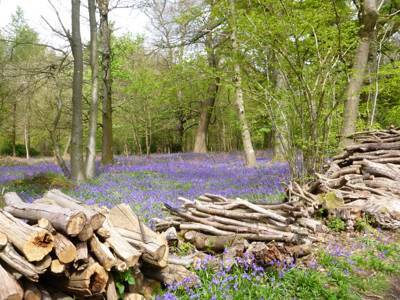 It's around an hour from London, so it's no surprise that this is one of the most popular Feather Down campsites. The land has been farmed by the Brock family for over 120 years. 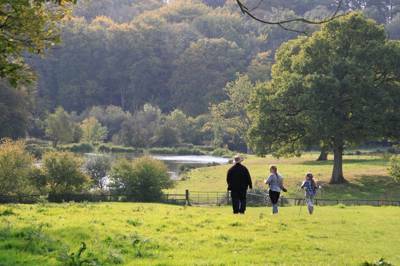 Its current owners, Anna and Will Brock, were responsible for transforming this slice of Hampshire into a camping haven, loved by families throughout the land. And what a job they've done. 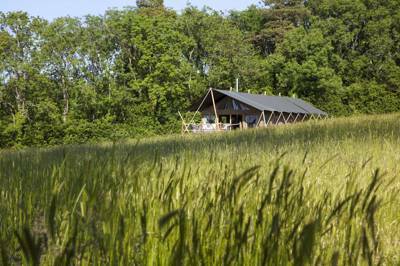 The five safari-style tents are in the old farm orchard, under trees or backed into hedgerows, and all look out over rolling countryside. Each tent has its own campfire – hire the stewpot for hearty Autumnal meals, or simply toast marshmallows as the night falls around you. Since this is part of the Feather Down Farms franchise, expect a luxurious camping experience. There are wood-burning stoves to keep campers toasty through the chilly months, real beds with thick, fluffy duvets, and a flushing loo. Long gone are the days of making a midnight dash back from the toilet block to hop into an icy sleeping bag. But it's not just a great place to rest your head, Manor Farm is a real foodie's delight. The farm is famous locally for its beef and sausages and Anna's award-winning ready meals are sold locally or available to purchase in the farm shop. You can pick up a range of meat and home-grown produce here too – their marinated butterflied leg of lamb is a long-standing favourite. In the morning, find fresh bread and warm, buttery croissants waiting to be devoured. So as the original birth place of the Feather Down Farms concept in the UK, Manor Farm is the place all camping cynics should be sent. Once they've woken up cocooned in a fluffy duvet, with their favourite paper waiting on the doorstep, they may never stay in a swanky Mayfair hotel again. There are five tents on site – each of which is large, sturdy and comes fully equipped. Each tent has a master bedroom, a bunk room and a small cupboard bed, and sleeps up to six (with a maximum of five adults). You'll have your own running water and a flushing toilet, and there's a separate block with hot showers. There's an honesty shop onsite, in case you need to replenish supplies, a hen house, and a clay oven for communal suppers. Wandering off site, there are some great local pubs in the village, wild swimming at Frensham Ponds, or a more traditional paddle at West Wittering, if you're not deterred by a 50-minute drive. One of the best ways to explore the area is on two feet or two wheels. Fortunately, Anna has prepared some great walks or bike rides, for a variety of levels. There are additional trails at Alice Holt Forest, which are suitable for kids of all ages. The Watercress Line may sound like a phantom route on the London Underground, but it's actually a heritage steam train that runs 16 km from New Alresford to Alton. They run a variety of events throughout the year (including a visit from Thomas the Tank) so it's worth checking their website. Manor Farm is less than 30 minues from Winchester. Whilst there, take a trip to Intech (01962 863791) – a hands-on science centre and planetarium that holds over 100 interactive exhibits. There's a real treasure trove of food to dig into at the farm – Anna's ready meals are well know throughout the local area, and for good reason! If you feel like a change of scenery, there are plenty of local pubs to choose from, including The Eight Bells (01420 82417) and The Railway Arms (01420 82218), which backs onto the local rail line. The Yew Tree (01256 389224) is a cosy pub in pretty village of Lower Wield which serves home-cooked food in generous portions. Exit the M3 at Junction 10. At roundabout, take the 3rd exit, then at next roundabout take the 2nd exit signposted A31 Alresford. Remain on the A31 towards Alresford/Alton, through Ropley and Four Marks. Continue straight ahead the exit left to Alton. After leaving the A31, go all the way around the first mini roundabout onto the B3006 towards Selborne (Liss). After 1 mile, turn left at the crossroads, signposted West Worldham. Follow the narrow lane for ½ mile. After the farm buildings on your left, turn left into Manor Farm. Exit the M4 at junction 11. Follow the A33 towards Basingstoke and continue until you go through Hook. Continue straight, towards South Warnborough, then turn right, then left, then left at the three roundabouts, and head towards Odiham. At the next small roundabout, turn right towards Alton. After ¼ mile, turn left, signposted Chawton/Selborne. Turn right at the next mini roundabout and immediately left at adjoining mini roundabout onto the B3006 towards Selborne (Liss). After 1 mile, turn left at the crossroads, signposted West Worldham. Follow the narrow lane for ½ mile. After the farm buildings on your left, turn left into Manor Farm. Exit the M3 at Junction 4, following signs for A331. Continue on the A331 towards Farnham (approx. 6 miles) then take the 2nd exit at the next roundabout, onto the A31 towards Farnham/Alton. Keep left at next roundabout, staying on the A31. Continue on the A31 until you reach the signposts for B3006 Selborne. At the T-Junction, turn left onto the B3006 to Selborne. After 1 mile, turn left at the crossroads, sign posted West Worldham. Follow the narrow lane for ½ mile. After the farm buildings on your left, turn left into Manor Farm.